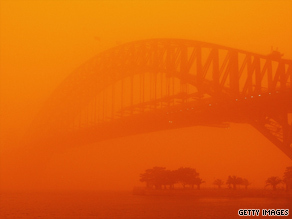 Some residents of Sydney, Australia thought it was Armageddon. The red sky, thick with dust was unlike anything anyone had ever seen. CNN I-reporters had their cameras ready to capture these incredible images. “I could smell it before I knew what was happening, I thought the world was ending.” Sydney I-reporter Pablo Albani told CNN. The past couple of days red dust filled the skies from Syney to Brisbane. Planes were grounded at the airport. Emergency services received calls from people having difficulty breathing. Just where was all this dust coming from and why was the sky red? “The dust collected in the interior deserts of Australia around 1000 miles from Sydney by equally high winds associated with a strong frontal system.” explains Dr. Gregory Holland, a native Australian, as well a director of meso and microscale meteorology at NCAR, the National Center for Atmospheric Research based in Boulder, Colorado. Holland says the central desert dust has a large iron content, which oxidizes to red. That’s where the red hue to the sky comes from. Central Australia is often referred to as “red center” because of this color effect. Australia faced extreme weather in all forms recently: from floods to fires, and even thunderstorms with huge hailstones. The floods and storms were part of the same weather system that carried the dust. Holland says the dust storms in down under typically follow long periods of drought and will likely happen again in the Southeastern Region of Australia. Even though authorities say they’re unrelated, a number of alleged terror plots were uncovered this week. The timing is apparently just a coincidence. But still, it’s not every week we hear about arrests in Denver, New York, Dallas, and Springfield, Illinois. Lots of questions for you – do you want to hear about thwarted terror plots or would you rather the government keep that information to itself? Does news like this make you feel more or less safe? Does it make you more or less vigilant? The quirky, sweater wearing Dr. Huxtable, his wife and five kids were one of TV’s all-time favorite families. Bill Cosby’s sitcom wife, Phylicia Rashad, and TV son, Malcolm-Jamal Warner, joined us live in the CNN Newsroom today. They shared some of their favorite moments with us.